Earlier this year, Rebecca relocated to Paris to provide her family with the transformative experience of living abroad that she enjoyed as a child. 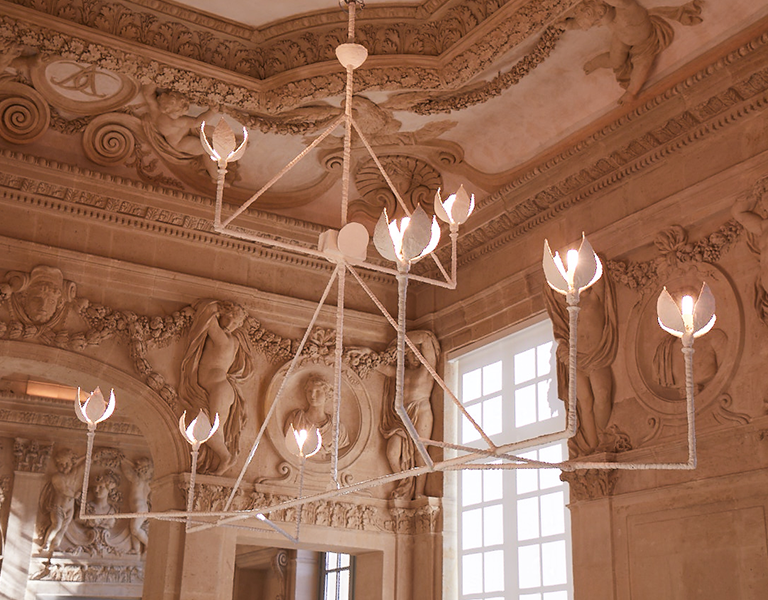 The City Of Light has always inspired her and she draws influences from every corner—gardens and museums to markets and cafes. We followed her around the city exploring some of her favorite sights, shops and restaurants. Rebecca’s favorite chandelier at the Picasso Museum. Adjacent to the Louvre and the Seine, the sprawling Tuileries Gardens are just as popular with first-timers as they are with locals. Rebecca loves to stroll through, drawing inspiration from the seasonal flowers for her signature floral prints. 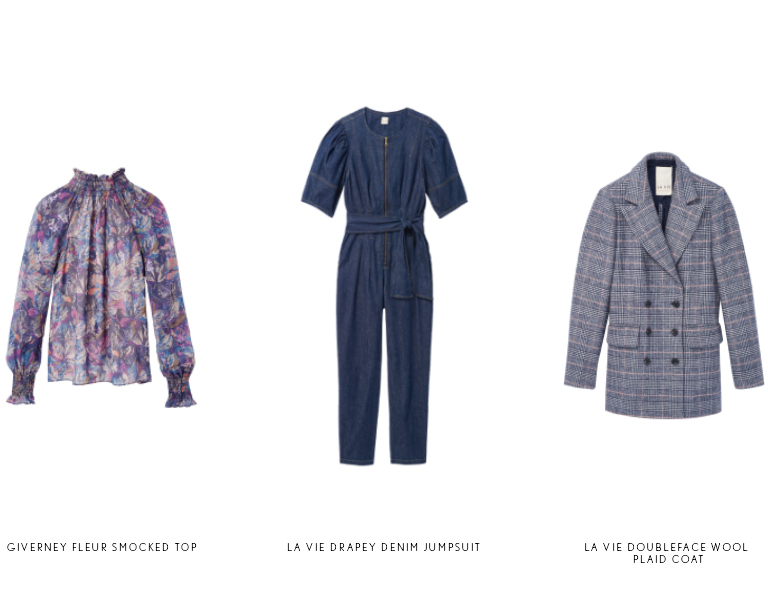 Paris is a city built for meandering and Rebecca’s favorite neighborhood to explore is the colorful, diverse Pigalle. Once known for its nightlife, this area is now filled with clusters of shops and bars to be discovered in its narrow, winding streets. Located in an ornate old hotel in the artsy Marais neighborhood, the Picasso Museum is a destination even before you see the collection. 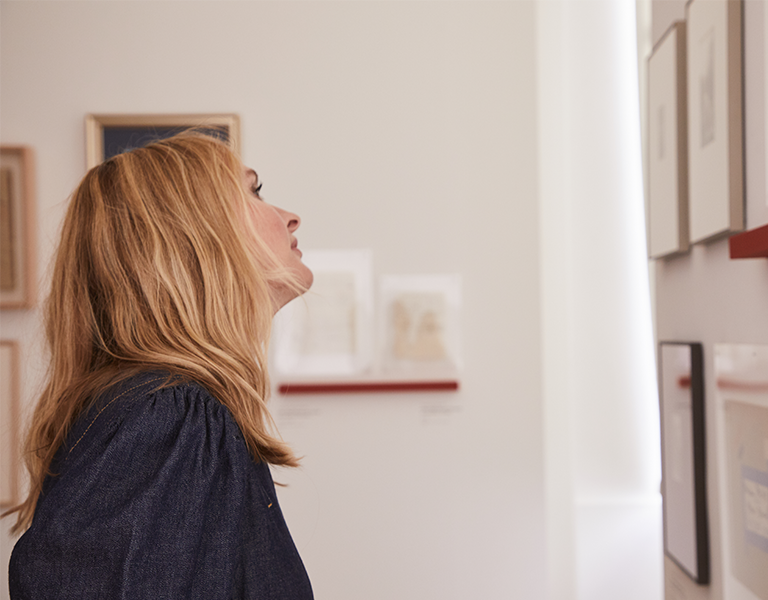 In addition to Picasso’s own oeuvre, the museum showcases Picasso’s personal art collection, including work by contemporaries Cézanne, Matisse, Degas and Renoir. An abandoned viaduct that has been converted to an elevated promenade, this three-mile park offers a scenic stroll from the Bastille to Bois de Vincennes. The top walkway is lined with greenery and offers spectacular views of the city while the ground level is filled with artisan workshops and storefronts of local jewelers, glass blowers and other artists. 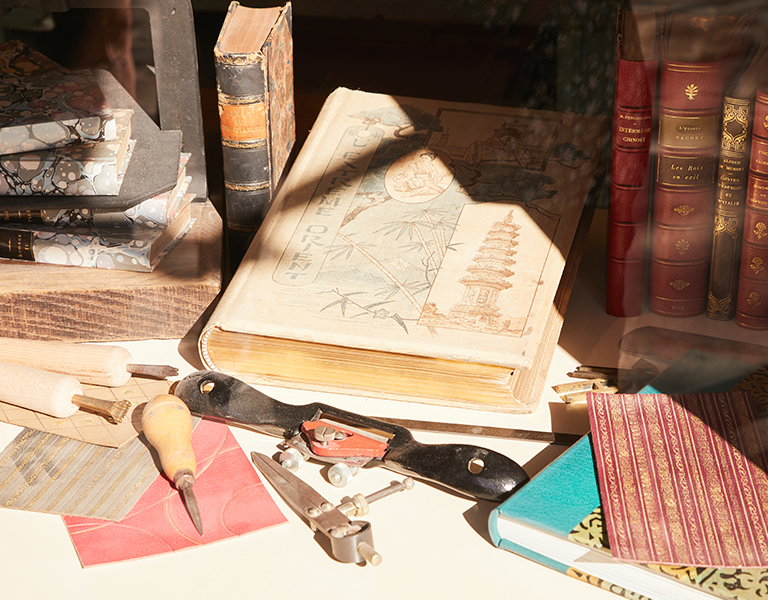 Vintage-inspired finds at Astier de la Villatte and Atelier de Reliure. The largest market of antiques and second-hand goods in the world is further north than most of the central attractions of Paris, but well worth the trip. Filled with vendors selling vintage glassware, furniture, art, clothes, books and more, many of Rebecca’s designs are inspired by pieces found here. 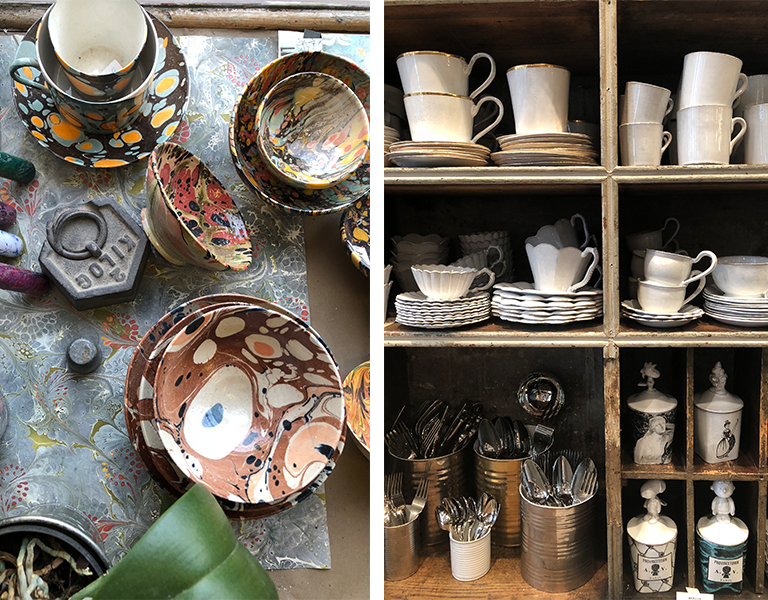 These antique-inspired ceramics and housewares are handmade in France, meaning each piece is one of a kind. With a boutique in the center of the city, stop by for memorable gifts after you visit the Louvre or pass through the Tuileries Gardens. Rebecca’s husband, artist Wayne Pate, discovered a print shop on a leisurely neighborhood walk. 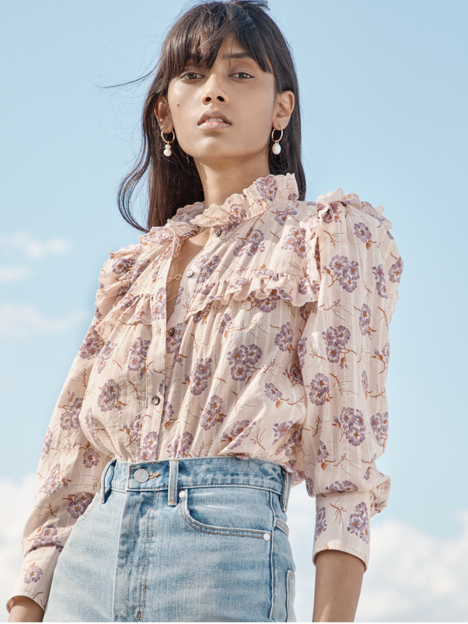 Their thoughtful craftsmanship and expansive selection of vintage paper prints have provided endless inspiration for the prints and designs of the RT collection. 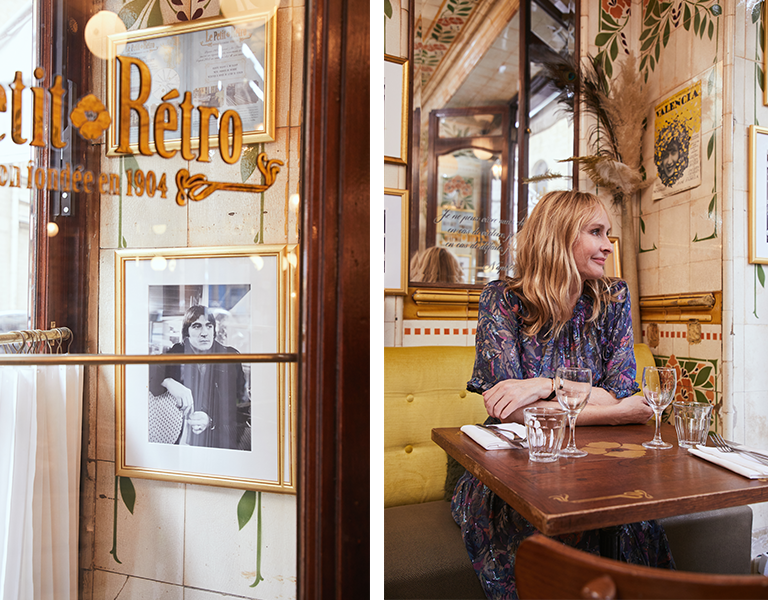 Appreciating traditional French fare at Petit Rétro. An iconic Parisian café, Les Deux Magots was once a hang-out for the intellectual crowd of writers and painters like Ernest Hemingway and Pablo Picasso. Now, it’s a lively spot to sit outside and sip an espresso or – Rebecca’s favorite – a hot chocolate. This bistro opened in 1904 and has kept its original Art Nouveau décor style. Just down the street from the Eiffel Tower and offering a menu of traditional French dishes, dining here is a quintessential Parisian experience. Each of the four stories of this lively Pigalle restaurant creates a different atmosphere through a mix of mid-century design and cozy, rustic touches. Its Italian menu changes every month to feature pastas, pizzas, salads and cocktails made with only the freshest seasonal ingredients which are crafted in open kitchens throughout the restaurant.